Please refer to our stock # 3325 when inquiring. 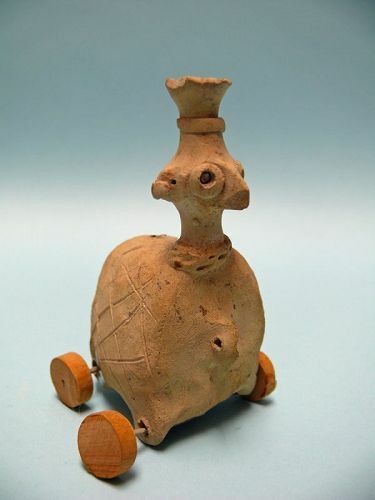 Syro Hittite Terracotta Zoomorphic Figure on Wheels, ca. 2nd - 1st millennium BCE. 5" x 3" diameter. One wheel not attached as seen in images. Some chips due to age and wear, otherwise in very good condition. Ex: S. Beiner collection, Florida.3 3/4" x 1 3/4" x 2 1/4". The ceremonial centers of the Syro-Hittite city-states (1200-700 BC) were lavishly decorated with large-scale, open-air figurative reliefs - an original and greatly influential artistic tradition. But why exactly did the production of such an array of monumental images ever start? This volume explores how Syro-Hittite monumental art was used as a powerful backdrop to important ritual events, and opens up a new perspective by situating monumental art in the context of public performances and civic spectacles of great emotional impact, such as processions, royal triumphs, and dynastic funerals.